zCover gloveOne CI921L Tech-Leather Carrying Case not only gives you the protection, and also gives mobility with a integrated rotary metal belt clip. "This is a new product add into our Cisco® Unified Wireless IP Phone accessories product line, zCover has always focused on the merging of function and style." said Sean Sa, vice president of zCover Inc. "zCover's gloveOne CI921L Tech-Leather Carrying Case design focused on intuitive usability while offering protection in its fullest form. " 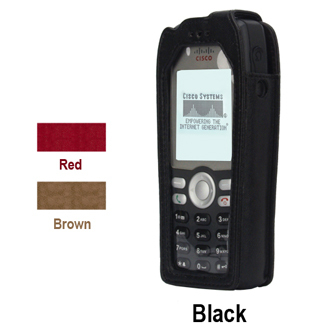 Each zCover gloveOne CI921L Tech-Leather Carrying Case retail pack contains one tech leather protective carrying case with an integrated rotary metal belt lip in its first release of the gloveOne CI921L, zCover is offering a selection of three colors: Black, Red and Brown. zCover gloveOne CI921L tech-leather carrying case compatible with Cisco® Unified Wireless IP Phone 7921G with Standard Battery Pack.